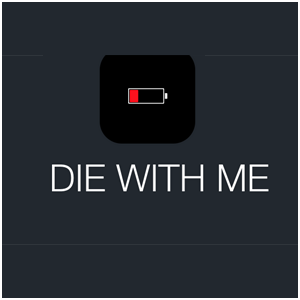 Die With Me lets your phone die with other people who have less than 5% battery left. No one wants to be alone when they die. The most peaceful death imaginable would come in one’s old age, surrounded by supportive friends and family members. It only makes sense that the same logic would apply to phone deaths. No one wants to undergo the terrifying prospect of having their phone battery die by themselves. It’s much more comforting to be around, or at least communicate with, people who are going through the exact same thing. 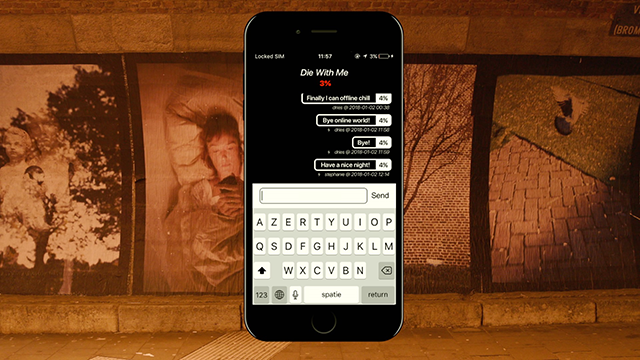 That’s the idea behind Die With Me, an app that’s only usable once the phone on which it is installed reaches 5% or less battery. My phone hasn’t yet reached 5% with this app installed, because like most people I obsessively make sure the battery is charged. For all I know, Die With Me may be a practical joke. Yet it’s a great, hilarious concept. The app consists of a chatroom filled with all the people around the world whose phones are on their way to shutting off completely. Or, as the app calls it, “offline peace.” It’s a gimmicky app that’s not going to bring people to lasting connections, but it is a nice idea that anyone is able to connect around the shared terror of a low battery meter. 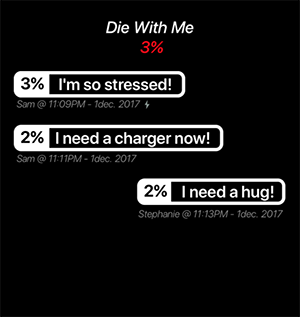 Die With Me isn’t going to change the world, but it will make people feel a little more comforted when their phone battery is on the verge of death.